DR Appliance is a Mesa Appliance Repair agency that specializes in the repair of appliances both big and small. We are committed to our work and are by and large one of the preferred repair agents in the city. We are known for our excellence and unique ability to keep our clients happy all the time. Our service cannot be compared to that of others because we go above and beyond to meet our clients’ needs. We boast of a well-trained team of technicians, chosen from the best in the industry. When you work with us, you will have the very best technicians working on your repair needs. Microwaves, toasters, TV’s you name it and we will fix it. Here at DR Appliance there is almost nothing we cannot fix. Whatever ails your appliance we will find a way to fix it. If it needs a part replaced then we will replace it. If it needs a major overhaul, then we will do it. There is no problem too big for us to solve, or a problem too small for us to handle. You can put your trust in us that we will fix your appliance and make it as good as new. When you work with us, you will never be surprised by any hidden fees. All our fees are explained to you in an upfront manner. There are no surprise costs that you will ever have to encounter. We are clear in how we speak to our clients because we want to give you the very best service possible. Refrigerators are a modern day convenience which we use to keep our food from going bad. Many times we hardly ever stop to think how important our refrigerators are until the day they stop working. Thanks to our efficient repair service, you never have to go another day without your refrigerator working. If you are a commercial owner in Mesa, then look no further than Mesa appliance repair top agents DR Appliance. Don’t waste any time in contacting us. We know just how important your commercial refrigerators are, and how much loss you can make when they aren’t working. We are well known for our rapid response and evaluation of the situation, giving you a quote in the process so we can begin work as soon as possible. You never have to worry so long as we are only a phone call away. We are experts when it comes to fixing the refrigerator problems. We can also be contacted for routine refrigerator maintenance work. Are your dryers giving you a headache because they are not functioning properly? Then it’s time to call the Mesa appliance repair experts, DR Appliance. Here at DR Appliance, dryer repairs are not an issue for us. We are well aware of the problems that dryers may pose and we know just how to fix them. Our technicians are only a phone call away. We can come over to your premises and evaluate the situation for you before we begin work. Sometimes the problem is only a small issue that can be resolved easily, and sometimes a major overhaul of your dryers may be needed. Whatever the problem, we will find it and fix it for you. Washing machines are literally life savers these days. Can you imagine a world where washing machines do not exist and you have to do a week’s worth of laundry by hand? Generations before us had no option but to do laundry that way, but you do not need to subject yourself to the hard labor if your washing machine stops working. All you have to do when your washer stops working is give us a call. We will be there in no time at all. If you are a restaurant owner and or a residential owner and are having difficulty with your dishwasher then you need to bring in Mesa appliance repair leading technicians to take a look at the dishwasher. Usually, the problem can be rectified almost immediately and is often nothing to worry about. When is it time to call DR Appliance? Dishwashers that don’t drain water properly. If your dishwasher’s problem isn’t listed above, still give us a call. We are certain that we will get to the bottom of what is making your dishwasher not function properly. 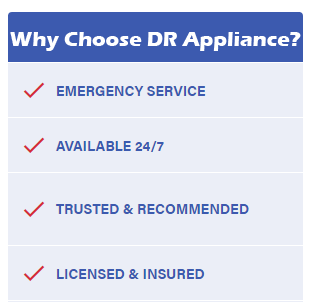 AC repairs in Mesa are easy thanks to DR Appliance. You never have to endure a sweltering summer without air con just because your AC is broken. This is why we are here. Whatever problem is ailing your AC we will find it and fix it. All you have to do is give us a call and we will be right by your front door in no time at all.